before the days of the ez-link card (for singaporeans), i’m pretty sure folks commuting on public buses have done bus ticket origami at least once. i love folding my bus tickets into little hearts and that’s probably the only thing i know how to fold other than a crane. while it’s nice that the main intention of this ad is not trying to sell anything but to engage the bus commuters, i think it’s a very powerful ad. 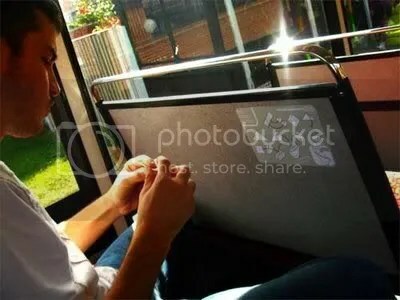 the commuter is bored during the journey and is thankful that there’s something for him/her to do. all the attention is focused on the ad and the instructions are very easy to follow. satisfaction comes when the commuter is able to fold his/her ticket into the desired outcome and will then smile and silently thank the advertiser for putting it up. 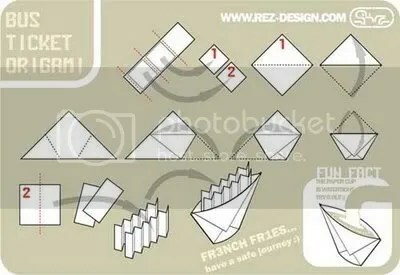 since this particular bus ticket origami is to make paper french fries; imagine if mcdonald’s was the advertiser, don’t you think it’ll be a great interactive advertisement? great idea, thanks for the post!